Journalist Laura Ling and Euna Lee, who were held captive by N.Korean officials and sentenced to hard labor for entering N.Korea illegally, were pardoned and released back to the US. 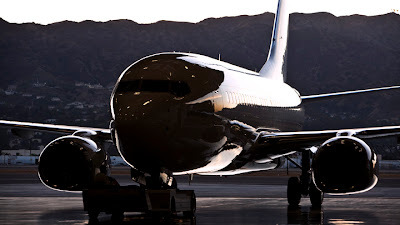 The pair landed early this morning at Burbank Bob Hope Airport via a snowy white 737. Euna Lee bowed as she exited the plane and they both cried and ran into the arms of their loved ones. 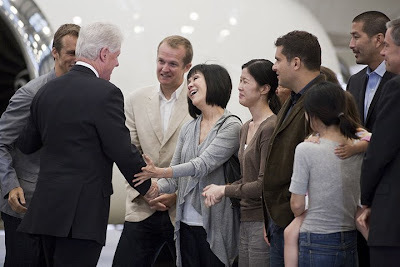 Former President Bill Clinton flew to N.Korea to help arrange for the release of the two. Former VP Al Gore was on hand to greet them as well. 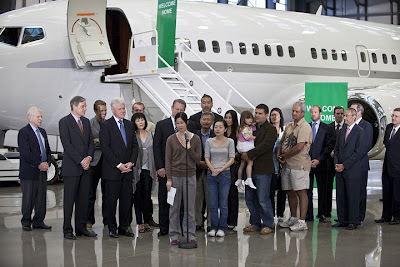 Laura Ling gave an emotional briefing to the throng of waiting journalist, Euna Lee and President Clinton did not speak.